26 Health Benefits of Beer: Why You Should Have a Glass of Beer? Beer is one of the most commonly used alcoholic drinks in the world and it is third most popular drink in the world, right after tea and water. Beer is brewed by the saccharification of starch and fermentation of the resulting sugar. Saccharification is the process where a complex carbohydrate (like starch) is divided into its monosaccharide components. Beer has a long history and it belongs to a group of oldest prepared beverages. First traces of beer production date back to 9500 BC, early Neolithic period. It is also recorded in history of ancient civilizations of Egypt and Iraq. Sumer people fermented bread in order to make a pulp which was characterized by the intoxicating effect. They referred to it as a divine drink. Babylonians produced beer too and it is assumed they had about 20 different types of beer. Egyptians buried beer and malt with Pharaohs to offer them some nourishment in the afterlife. Romans drank beer as well. Even though they preferred wine, some parts of the Roman Empire were known for beer consumption. During the Middle Ages monasteries brewed beer and some monks drank up to 5l of beer per day. In the year 822AD hops was introduced into beer production and Germany was the first country to use it. Germany was also the first country to implement ingredient regulation with The Reinheitsgebot of 1516, also known as The Purity Law. This law dictated that beer should be made of water, malt, and hops. It is usually believed that alcoholic beverages can only damage our brain, heart, and other organs. Regular consumption of alcoholic drinks is associated with damage and deterioration of our mind, body, and soul. However, beer has many health benefits and can improve our overall health in a lot of different ways. This article will discuss health benefits that come with consumption of beer. 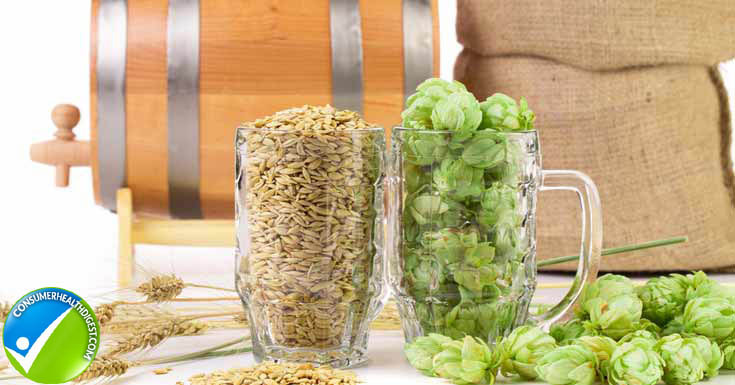 Barley – Is the main ingredient of the beer. Barley grains are usually low in proteins and fat, but they are rich in starch. Starch is consisted of sugar molecules and it is grain’s food reserve. Hops – Is a plant that can grow in height up to 20m. This plant is consisted of essential oils that offer distinctive flavor to the beer; it serves like a spice in the beer-making industry. Water – Beer is made mostly of water. 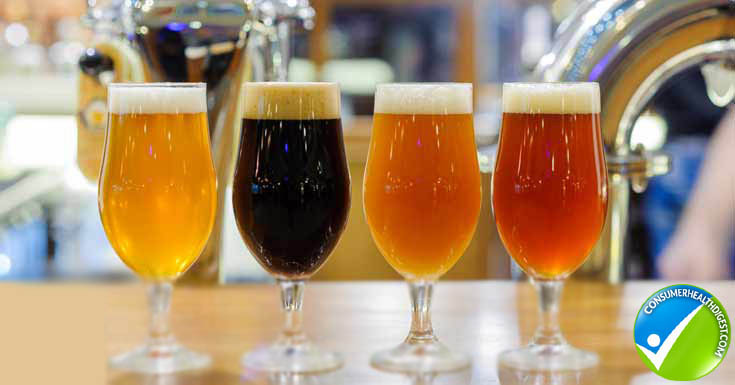 Different regions have water of different mineral composition which affects the flavor of the beer and that is why beers with same ingredients and formula from different regions can taste differently. Yeast – Produces flavor compounds and it is responsible for the fermentation of the beer. The function of the yeast is to metabolize sugars which were extracted from grains. This process leads to production of alcohol and carbon dioxide, in other words, it turns wort (liquid that is extracted during the brewing process) into beer. Prevents Type 2 diabetes – Moderate consumption of beer is associated with the lower risks of getting diabetes. About 15 different scientific researches have confirmed that beer reduces the risk of suffering from Type 2 diabetes. It is because beer increases insulin sensitivity. Protects against gallstones – Beer can also be good for decreased risk of symptomatic gallstone disease. Additionally, increase in beer consumption is associated with the decreased risk. Niacin or Vitamin B3 is essential for a good health. Deficiency of niacin is indicated by the rash, diarrhea, and neurological deficits. Riboflavin – Is also known as Vitamin B2. Deficiency of this vitamin includes symptoms like sore throat, lesions of the lips, conjunctivitis, and some skin conditions. Pantothenic acid – Or Vitamin B5. Low level of Vitamin B5 in an organism can lead to headache, insomnia, fatigue, intestinal disturbances, tingling and numbness of hands and feet. Folate – Or folic acid is Vitamin B9. Deficiency of this vitamin can be displayed through fatigue, lethargy, tender tongue, pale skin, irritability, and diarrhea. Other B vitamins – Beer is rich in B vitamins and according to some studies, people who drink beer have 30% more B vitamin in their body than non-beer drinkers. Improves brain health – Scientists proved that, xanthohumol, a flavonoid that is found in beer can improve cognitive function. Improves heart health – People who drink beer have 42% lower risk of getting cardiovascular disease, comparing to people who don’t drink beer. Moderate consumption of beer can lower the chances of getting heart attack. Boosts creativity and problem-solving skills – Scientists conducted a study where men who drank beer and men who didn’t had to solve a verbal puzzle while watching the movie at the same time. The result of the study showed that men who drank beer solved problems before men who didn’t drink beer. This leads to a conclusion that beer has a positive effect on our problem-solving abilities. Improves kidney function – Moderate consumption of beer lowers chances of developing kidney stones by 40%. Researchers weren’t able to find the connection between the beer and kidney function but it is assumed it is due to the fact that consumption of beer leads to frequent urination. Another theory includes hops which slow down the release of calcium from our bones (calcium is reabsorbed by kidneys and forms stones). However, regardless of the reason, beer is beneficial for the proper function of our kidneys. Speeds up recovery process – This is especially beneficial for people who exercise regularly. Scientists conducted a study where participants had to exercise until they reach 104 degrees body temperature. Participants had to re-hydrate with beer or water and the results showed that people who drank beer recovered faster and had better hydration than people who drank water. Improves metabolism – Beer can boost metabolism and prevent your body from absorbing fat. Prevents formation of cataracts – Consumption of beer improves antioxidant activity that prevents cataracts from forming and spreading in your eyes. Antioxidant activity protects mitochondria cells in the eyes. Damaged mitochondria cells can lead to the incidence of cataracts. Lowers blood pressure – People who drink beer are less likely to develop high blood pressure. High blood pressure can lead to numerous problems and affect heart and coronary arteries, and potentially leads to stroke. Protects from infections – Beer can improve the immune system and protects our body from infection. Strengthens Bones – people who drink beer have 4.5% better bone density than people who don’t drink beer. Beers contain dietary silicon which is important for development and growth of bone and connective tissue. Drinking beer can even help fight osteoporosis. Improves digestion – Beer is a great source of fiber (especially dark beer). In this department, beer is even better choice than wine which doesn’t contain fiber. Fiber deficiency can cause intestinal and gastric disorders. Lowers bad cholesterol – Fiber in beer is not only good for proper digestion, it is also good for lowering LDL (low-density lipoprotein) which is usually referred to as “bad cholesterol”. Meanwhile, HDL cholesterol (High-Density Lipoprotein) or “good cholesterol” is improving. Promotes sleep – Beer’s components nicotinic acid and riboflavin promote sleep and fight insomnia. Prevents blood Clots – Moderate intake of beer can be a good “blood thinner” for elderly people and patients who suffer from deep vein thrombosis. Deep vein thrombosis is caused by blood clots in veins and the condition can often be life-threatening. Boosts Memory – Beer can trigger the growth of new brain cells and hence boost your memory. Relieves stress – Beer has a relaxing purpose, reduces stress and prevents anxiety, and decreases self-consciousness. Cure for cold – Hops contains humulone compound which helps our body fight the virus that causes cold. Barley increases blood circulation and helps you breathe when you have nasal congestion. Decreases risk of getting cancer – Xanthohumol affects cancer-causing enzymes and reduces the risk of suffering from cancer. It is important to mention that xanthohumol is more powerful than genistein (component found in soy). Are all Beers the Same? Even though beers generally contain same set of ingredients, they are not all the same. In order to get the best out of your beer you should be careful when you are purchasing the product. Some beers contain genetically modified ingredients, while some contain sweeteners, corn syrup, preservatives. It is recommended to purchase craft beers. These beers are produced in microbreweries which do not mass produce their products. Microbreweries are focused on flavor, quality of the beer, and development of brewing technique. On the other hand, mass produced beers contain questionable ingredients and the companies are more focused on the quantity rather than on quality of the product. Without sweeteners or corn syrup. 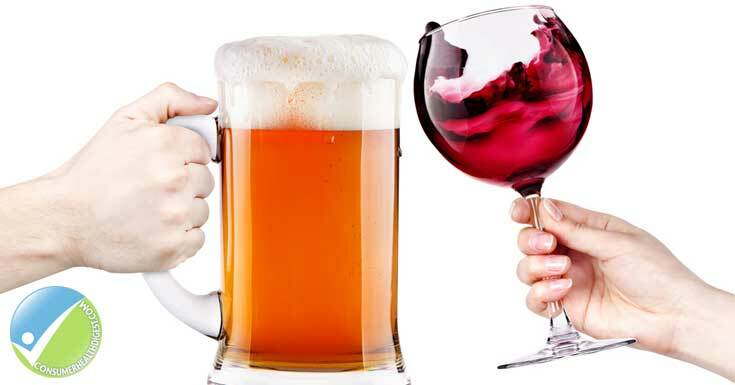 Beer vs Wine – Who Wins? It is widely believed that out of all alcoholic beverages, wine have most health benefits. However, studies proved we were wrong. US National Library of Medicine published a research whose purpose was to investigate beer, wine, and their health benefits. Results of the study showed that beer can decrease the risk of getting cancer, obesity, diabetes. Moreover, like it was mentioned above, beer also contains fibers which improve digestion, while wine doesn’t contain fibers at all. However, another study proved that consumption of both drinks resulted with reduced chance of suffering from heart attack comparing to people who didn’t drink alcohol at all. Moreover, preferred drink didn’t make any difference. The conclusion is, although both drinks are heart-healthy, beer has more health benefits than wine. The key is moderation. Improper consumption of any of these drinks doesn’t have beneficial effect. How Much Beer Should I Drink Per Day? Beer can be healthy and is able to improve our health, boost immunity, and prevent many diseases. However, if you think the more you drink, the healthier you will be, you are wrong. The key to success can be found in moderation. Moderate drinking was mentioned throughout this article for a reason. If you consume too much beer it will not result in improved health. You should stay away from drinking more than 5 beers during a short period of time. Bottom line is, you should drink between one and three beers during the day and that is it. DO buy craft beers or other beers which do not contain harmful ingredients. DON’T let your beer get too cold. People usually think the colder the beer, the better it is. However, that is wrong. When beer is too cold you can numb your palate and decrease the ability to fully taste all its components. Experts suggest to slightly cool off the beer before drinking. DON’T store the beer in the light – light can decrease beer’s quality and that is why most companies have darker beer bottles. Additionally, the place you store your beer should be dark and cool. DON’T drink beer on empty stomach – it can change the way your body processes alcohol. DO try to be moderate – know when to stop. A few beers are more than enough to help you relax, retain their health benefits without eventually damaging your health. Beer is one of the most famous drinks in the world. This alcoholic beverage has a lot of health benefits and can prevent some diseases if consummated in moderation. How often do you drink Beer and What’s your favorite one? Please share your views in the comment box.